For those diagnosed with depression, feelings of sadness, hopelessness, apathy, and loss of pleasure are magnified and significantly impacts a client’s desire to engage in daily activities as well as therapeutic treatment to address depression. Art therapy provides an alternative to treatment where sufferers have previously been resistant to talk therapy methods. Art therapy is a non-judgmental and unobtrusive approach to exploring emotional pain through non-verbal methods. The client can create artwork which details their current mood and then uses the artwork as a basis of discussion around their mood. Art itself can provide the client with a method to stabilize mood through relaxing art techniques and creativity. Depression may result from hereditary factors, childhood trauma, biological issues and specific life stressors such as losing a job or going through a divorce. A key factor in determining the underlying issues of a client’s current state of depression is to explore how the client gives meaning to specific events and feelings. What may be a tragic event in one person’s life may be viewed as an opportunity for growth to another person. What makes this perception even more significant to the individual is how they are able to cope with the event. These two key areas of meaning and coping play a significant factor in whether an individual can recover from an event or retreat into behaviours that are relevant to depression. Summary of sessions to date: This is the second art therapy session that Simon has attended. In the first session, Simon explored some current feelings around his depression including the intensity of his depressive state. Simon was able to work on a timeline of his depression that began when he was 17. This is Simon’s second art therapy session. In the first session, Simon was able to determine his depression began when he was about 17 and has intensified in the past 2 months. Simon feels confused about his experience of depression and cannot understand why he is going through this. 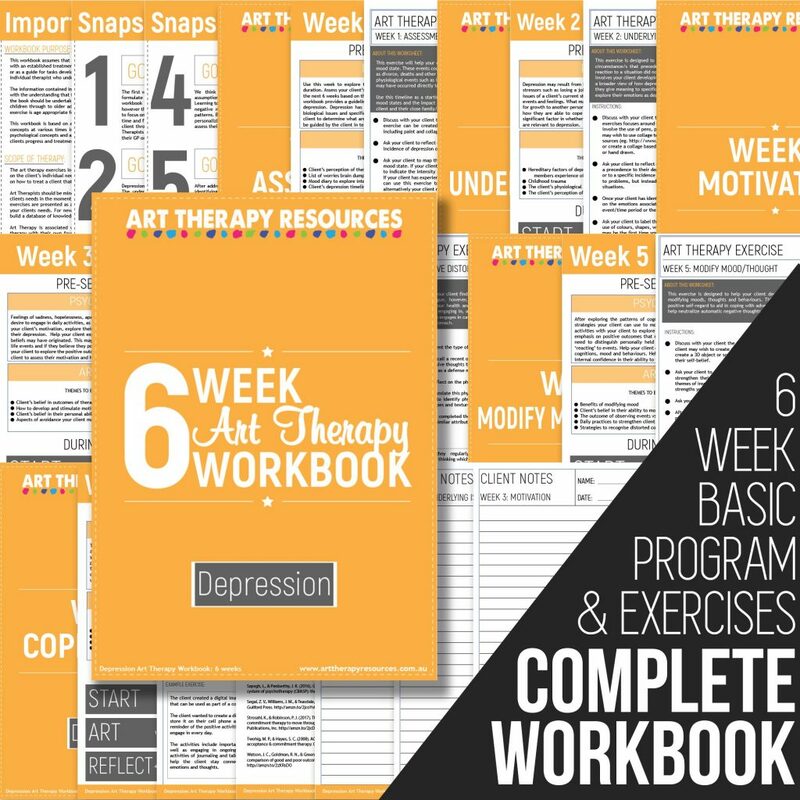 This art therapy exercise was taken from the Depression Workbook that can be purchased in the store. This exercise is designed to help your client understand their emotional response to the event/s or circumstance/s that preceded the current period of depression. It is important your client understands their reaction to a situation did not cause their depression. All exploration and subsequent discussion involve your client developing insight into their perceptions, reactions and coping mechanisms to gain a broader view of how depression impacts their lives. This exercise will help your client explore how they give meaning to specific events and feelings in their life. 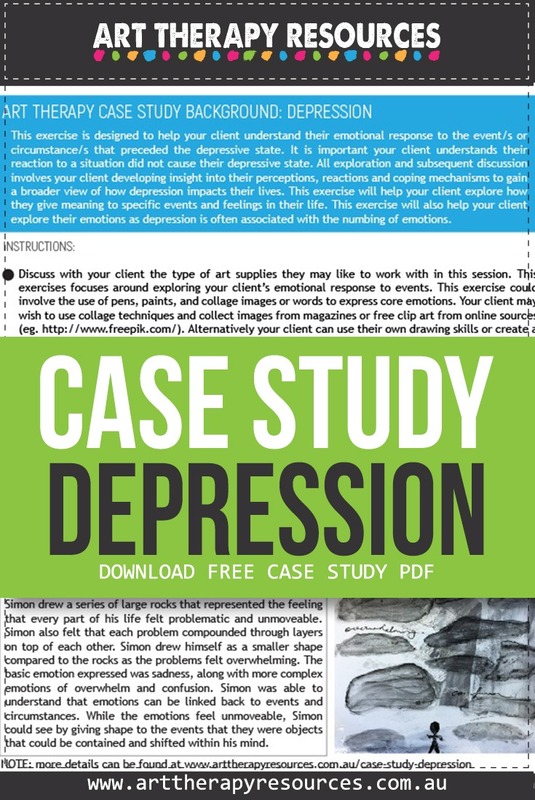 This exercise will also help your client explore their emotions as depression is often associated with the numbing of emotions. Discuss with your client the type of art supplies they may like to work with in this session. This exercises focuses around exploring your client’s emotional response to events. This exercise could involve the use of pens, paints, and collage images or words to express core emotions. Your client may wish to use collage techniques and collect images from magazines or free clip art from online sources (eg. http://www.freepik.com/). Alternatively your client can use their own drawing skills or create a collage based on powerful words. These words can also be cut out from other sources or hand drawn. Ask your client to reflect on a period of time or a specific event that they perceive may have been a precedence to their depression. This could refer to a general period of time such as childhood or to a specific incidence such as personal loss or trauma event. This exercise is not to seek causes to problems, but instead, to ignite your client’s ability to explore their emotional response to situations. Once your client has identified their specific event or generalised time period, ask them to reflect on the emotions associated with that event. This may be the emotions felt at the time of the event/time period or the emotions they are feeling while recalling the event/time period. 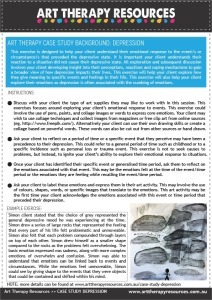 Ask your client to label these emotions and express them in their art activity. This may involve the use of colours, shapes, words, or specific images that translate to the emotions. This art activity may be the first time your client acknowledges the emotions associated with this event or time period that preceded their depression. Simon client stated that the choice of grey represented the general depressive mood he was experiencing at the time. Simon drew a series of large rocks that represented the feeling that every part of his life felt problematic and unmoveable. Simon also felt that each problem compounded through layers on top of each other. 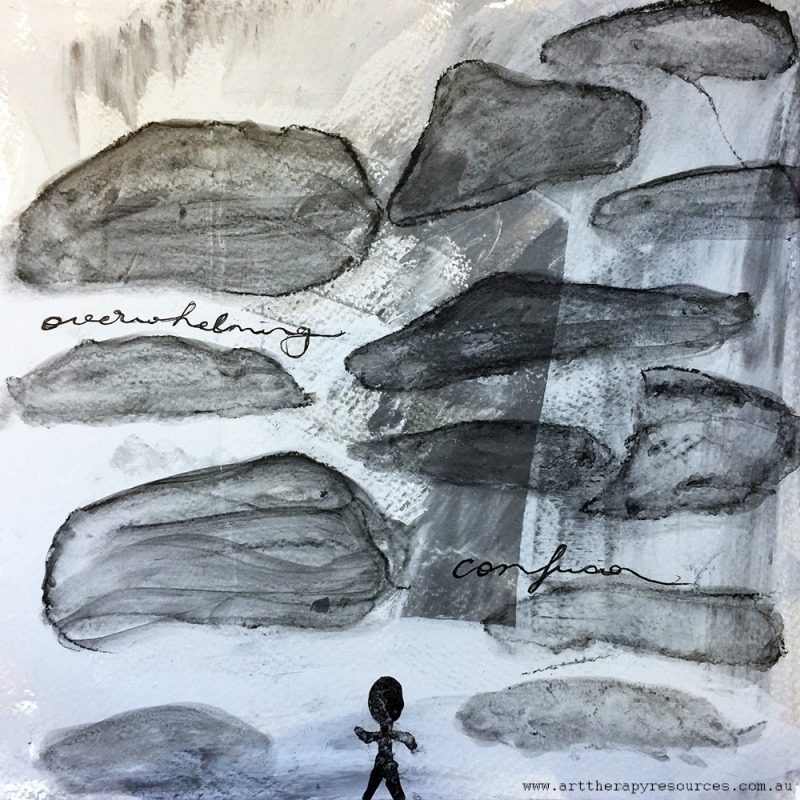 Simon drew himself as a smaller shape compared to the rocks as the problems felt overwhelming. The basic emotion expressed was sadness, along with more complex emotions of overwhelm and confusion. Simon was able to understand that emotions can be linked back to events and circumstances. While the emotions feel unmoveable, Simon could see by giving shape to the events that they were objects that could be contained and shifted within his mind.